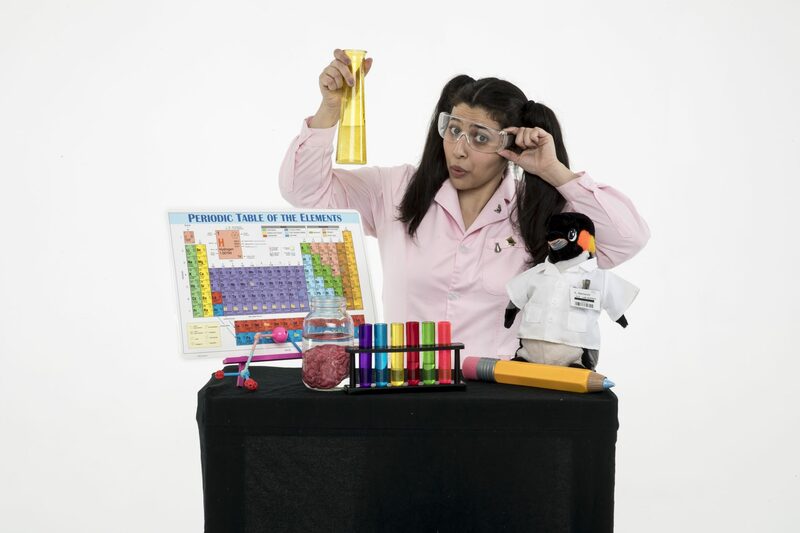 Explore the world through the eyes of Jargie the Science Girl!, and her lab assistant, Benjamin the Penguin. Young audiences are invited to visit her laboratory for an energetic, interactive scientific adventure that is sure to rattle the molecules of their minds! Bubbles, chemical reactions, rockets, and dooblybloppers galore, this 1-hour performance is filled with exciting experiments and demonstrations based on the Next Generation Science Standards. The adventure would not be complete, without exploring the science behind the jargon, and paying homage to some of the brilliant minds that loved science a long, long, long time ago. More than just a science education show, the performance is a full theatrical spectacle featuring larger-than-life props, multimedia, and an excess of high-energy quirk. Plus 3 hotel rooms and ground transportation. RUNNING TIME: 60 Minutes (No intermission) Performance is also available for school matinees as part of your outreach series. BILINGUAL VERSION NOW AVAILABLE, TOO! Phantom Projects Theatre Group enters their 21st year of producing and presenting live theatrical events geared towards children and teens, through a combination of literature-based works, message-based dramas, and family entertainment. For the past 18 years, the troupe has been a resident group at the 1,300-seat La Mirada Theatre for the Performing Arts where they present a 6-show season. Each year, they also travel to nearly 50 Southern California schools with shows about bullying, racism, prejudice and tolerance. 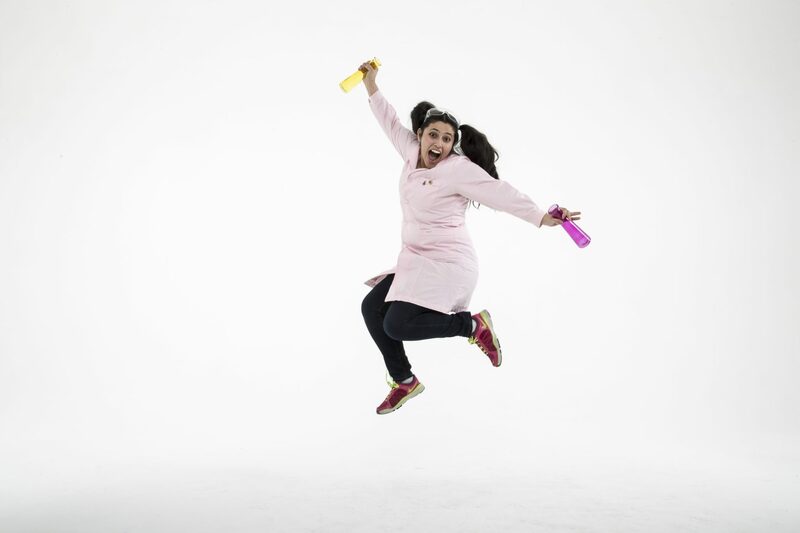 Jocelyn Argueta (Co-Creator, Writer, Performer) is a quirky biochemist eager to share her love for science, theatre, oxidative stress-induced mitochondrial dysfunction, and the color pink. She received her Bachelor’s degree in Biochemistry and Molecular Biology from the University of California, Irvine and has taken an active role in Neurobiology research focusing on neurodegeneration and aging diseases. Her work in Alzheimer’s disease and Down syndrome cell characterization was recently published in the Journal of Alzheimer’s Disease. She worked in the private sector, researching allergy diagnostics, with a patent pending in chemistry customization, after which she discovered her passion for arts education as a K-8 science instructor at a private academy. Steve Cisneros (Co-Creator, Director, Founder of Phantom Projects) created Phantom Projects Theatre Group in 1997 at the age of 17, out of his parents’ 2-car garage. Overseeing the daily operations for the past 21 years, the troupe has been featured by and written about in Forbes, CBS, NBC, ABC, FOX, Washington Post, LA Times, and in publications from nearly 40 states around the United States. With a background in the performing arts, Cisneros has worked for Nederlander, South Coast Repertory, McCoy Rigby Entertainment, La Mirada Theatre and many more. He’s directed over 50 productions and produced over 100. In 2017, for his work in using theatre as a teaching tool for at-risk youth, Cisneros was recognized with the Ambassador of Peace Award from the Orange County Violence Prevention Coalition. Other honorees included a Judge, and a police officer, proving the power of theatre and the impact on young minds.